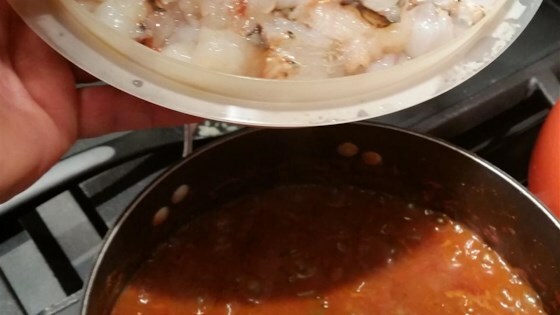 "Here is an easy recipe for that New Orleans favorite: shrimp in a spicy red gravy. If you already have stock on hand, its a very quick, easy meal with a huge 'wow' factor." In a medium stock pot, combine the reserved shrimp shells, 1/2 onion, 1 carrot, 2 strips celery, and 4 cups water. Simmer for 1 hour, uncovered; stirring occasionally. Strain the stock into a smaller saucepan, boil and reduce the stock to 2 cups. Remove from heat. In a heavy skillet, melt grease over medium heat. Add the onions, celery, garlic and green bell pepper; saute until soft and beginning to caramelize around the edges. Add the bay leaves, salt, black pepper, brown sugar, cayenne pepper, hot sauce, and 2 cups reduced shrimp stock. Bring to a boil and add crushed rosemary, crushed thyme, crushed basil, tomatoes, and tomato sauce. Cover and simmer over low/medium heat, stirring occasionally, for 1 hour. Add the cleaned and deveined shrimp. Stir, cover and turn off the heat. Let the shrimp sit for 15 to 20 minutes or until pink throughout. Sprinkle the green onions on top. See how to make grill-free New Orleans-style barbequed shrimp. I thought my mom took her creole recipe to the grave, but this is near perfect to hers..thanks so much for sharing!